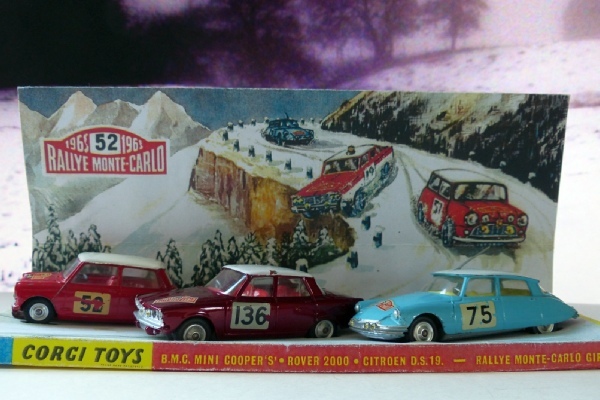 Here is a nice set of original cars in a reproduction box that a customer has asked me to sell for him. The three models are excellent, the faults being merely cracked transfers on the Mini, a chip on the Rover’s roof and a replacement fog lamp on the Citroen. In other respects these are superb models, difficult to find now in such good condition. The Citroen nearly always loses its aerial and replacements don’t look right. The box is not bad and looks quite original on display - it is a bit roughly printed but actually this makes it appear just a worn version of an original! If you had an original box these sets can sell for £2000+ these days. It was available from March 1965 for that year. The cars all had quite a short life. The 321 Mini was replaced in January 1966 by a 1966 Monte Carlo Rally edition. Same number but a different casting and now with RN2 and signatures on the roof. The 322 Rover was replaced in February 1967 with the white Sun International Rally edition, again with the same number but a different casting and RN21. The Citroen just stops being produced. You’ll see now that with such short sales periods these are very much in demand now and rare complete and in good condition.